"Whole wheat noodles and lean ground beef make this tasty favorite a little lighter." 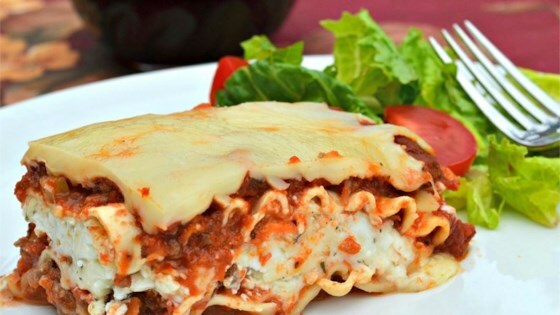 Here's a hearty yet simple meat lasagna that's perfect for a cozy night in. Easy and delicious!!! My husband went back for 3rds!!! I only used one egg...and used Ricatta instead of cottage cheese (I love ricatta). AWESOME RECIPE and I will absolutely make it again!!! Easy and delicious, I added fresh diced green peppers in with the layers. This was an easy recipe to make, the only modifications I made was adding Italian sausage. Going to add to my favorite recipes list!